United Kingdom Private 30901King's Own Yorkshire Light Infantry20/07/1918 Age: 21 I. D. 32. United Kingdom Rifleman 10852King's Royal Rifle Corps14/09/1914 I. A. 6. United Kingdom Private 19811King's Own Yorkshire Light Infantry20/07/1918 I. B. 16. United Kingdom Serjeant 200963York and Lancaster Regiment20/07/1918 Age: 23 I. D. 1. United Kingdom Private 29587Cameron Highlanders23/07/1918 Age: 20 I. C. 10. United Kingdom Driver 18946Royal Field Artillery27/05/1918 I. E. 9. United Kingdom Private 293206Black Watch (Royal Highlanders)20/07/1918 I. J. 1. United Kingdom Private 17224York and Lancaster Regiment21/07/1918 Age: 25 I. B. 26. United Kingdom Private 37906York and Lancaster Regiment23/07/1918 I. B. 4. United Kingdom Corporal 201448York and Lancaster Regiment20/07/1918 I. B. 7. United Kingdom Private 32862York and Lancaster Regiment20/07/1918 I. B. 5. United Kingdom Lance Serjeant 330087Royal Scots08/08/1918 Age: 25 I. F. 19. United Kingdom Private S/41285Cameron Highlanders23/07/1918 Age: 19 I. C. 12. United Kingdom Private S/13436Cameron Highlanders23/07/1918 Age: 30 I. C. 9. United Kingdom Private 31834York and Lancaster Regiment21/07/1918 Age: 35 I. A. 14. United Kingdom Private 11503Royal Scots14/09/1914 Age: 23 I. A. 22. United Kingdom Corporal 32865York and Lancaster Regiment20/07/1918 Age: 22 I. D. 23. United Kingdom Private S/41036Black Watch (Royal Highlanders)24/07/1918 Age: 26 Coll. grave. I. H. 1-6. United Kingdom Private S/6569Seaforth Highlanders14/10/1918 I. F. 20. 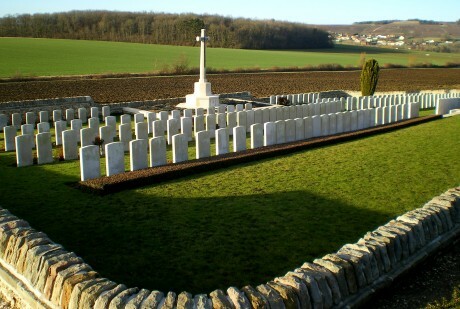 United Kingdom Private 14651Grenadier Guards23/09/1914 Age: 25 I. B. 19. United Kingdom Second Lieutenant Coldstream Guards06/09/1914 Age: 21 I. G. 1. United Kingdom Lance Corporal 36940King's Own Yorkshire Light Infantry20/07/1918 I. D. 5. United Kingdom Private 49966Cheshire Regiment31/05/1918 Age: 27 I. E. 26. United Kingdom Private 54204Royal Welsh Fusiliers30/05/1918 Age: 32 I. F. 3. United Kingdom Private 12286Grenadier Guards27/09/1914 Age: 29 Sp. Mem. United Kingdom Private 191922Labour Corps10/06/1918 Age: 22 I. E. 8. United Kingdom Private 103031Royal Army Medical Corps05/06/1918 Age: 28 I. F. 17. United Kingdom Private 51806King's Own Yorkshire Light Infantry20/07/1918 Age: 19 I. A. 16. United Kingdom Private S/23312Gordon Highlanders21/07/1918 I. E. 18. United Kingdom Private 62526King's Own Yorkshire Light Infantry20/07/1918 I. D. 31. United Kingdom Private 37074King's Own Yorkshire Light Infantry20/07/1918 I. B. 1. United Kingdom Private 7141Royal Scots13/09/1914 Age: 31 I. A. 21. United Kingdom Private 17876York and Lancaster Regiment21/07/1918 Age: 23 I. B. 27. United Kingdom Private 203740Duke of Wellington's (West Riding Regiment)23/07/1918 I. C. 16. United Kingdom Serjeant 310155Black Watch (Royal Highlanders)24/07/1918 Age: 34 Coll. grave I. H. 1-6. United Kingdom Private 53150Royal Scots23/07/1918 Age: 19 I. E. 4. United Kingdom Private 11974Grenadier Guards03/10/1914 Age: 28 I. B. 18. United Kingdom Private 37454King's Own Yorkshire Light Infantry20/07/1917 I. D. 18. United Kingdom Lance Corporal 201208Cameron Highlanders23/07/1918 Age: 30 I. C 14. United Kingdom Private 53206Cheshire Regiment31/05/1918 I. E. 25. United Kingdom Private 39396King's Own Yorkshire Light Infantry20/07/1918 I. D. 6. United Kingdom Private 291296Gordon Highlanders21/07/1918 I. E. 19. United Kingdom Serjeant 240147Black Watch (Royal Highlanders)27/07/1918 Age: 27 I. E. 6. United Kingdom Private 11814Grenadier Guards24/09/1914 Age: 27 Sp. Mem. United Kingdom Private S/32083Cameron Highlanders23/07/1918 Age: 19 I. C. 7. United Kingdom Private S/43371Cameron Highlanders24/07/1918 Age: 18 I. C. 11. United Kingdom Private 16/1772Northumberland Fusiliers06/06/1918 I. F. 13. United Kingdom Private 35562York and Lancaster Regiment21/07/1918 Age: 24 I. A. 9. United Kingdom Private 40888Hertfordshire Regiment20/02/1919 Age: 35 I. F. 21. United Kingdom Private 202971York and Lancaster Regiment20/07/1918 Age: 21 I. B. 9. United Kingdom Private S/75565Cameron Highlanders23/07/1918 Age: 24 I. C. 8. United Kingdom Private 19616York and Lancaster Regiment20/07/1918 I. A. 29. United Kingdom Private S/25061Black Watch (Royal Highlanders)24/07/1918 Coll. grave. I. H. 1-6. United Kingdom Lance Corporal S/16759Black Watch (Royal Highlanders)20/07/1918 I. E. 3. United Kingdom Private 351210Black Watch (Royal Highlanders)24/07/1918 Coll. grave. I. H. 1-6. United Kingdom Private 62558King's Own Yorkshire Light Infantry20/07/1918 I. A. 30. United Kingdom Private 32896York and Lancaster Regiment20/07/1918 Age: 37 I. D. 21. United Kingdom Private 50533Royal Warwickshire Regiment30/05/1918 Age: 19 I. C 18. United Kingdom Lance Corporal 20518King's Own Yorkshire Light Infantry26/07/1918 Age: 28 I. F. 14. United Kingdom Lance Corporal 240964Gordon Highlanders28/07/1918 Age: 22 I. E. 2. United Kingdom Private 36180Wiltshire Regiment10/06/1918 I. F. 16. United Kingdom Private 32297York and Lancaster Regiment21/07/1918 Age: 20 I. B. 13. United Kingdom Private 15403Grenadier Guards30/09/1914 Age: 26 Sp. Mem. United Kingdom Private S/41191Black Watch (Royal Highlanders)24/07/1918 Age: 19 I. H. 5. United Kingdom Private S/41198Black Watch (Royal Highlanders)25/07/1918 Age: 19 I. E. 15. United Kingdom Private 130096Gloucestershire Regiment03/06/1918 I. F. 18. United Kingdom Private 67372Devonshire Regiment20/07/1918 I. G. 2. United Kingdom Sapper 49087Royal Engineers02/06/1918 I. F. 12. United Kingdom Private 44004York and Lancaster Regiment20/07/1918 Age: 27 I. A. 28. United Kingdom Private 203332King's Own Yorkshire Light Infantry20/07/1918 I. B. 2. United Kingdom Private 24683Duke of Wellington's (West Riding Regiment)23/07/1918 I. C. 15. United Kingdom Corporal 201301York and Lancaster Regiment20/07/1918 I. B. 10. United Kingdom Private 235793York and Lancaster Regiment21/07/1918 Age: 36 I. A. 26. United Kingdom Lance Corporal 11602Grenadier Guards05/10/1914 Sp. Mem. United Kingdom Private 201679York and Lancaster Regiment24/07/1918 Age: 28 I. D. 9. United Kingdom Private 3999 5th (Royal Irish) Lancers03/09/1914 I. H. 7. United Kingdom Private S/42348Gordon Highlanders30/07/1918 Age: 18 I. J. 2. United Kingdom Private 235156King's Own Yorkshire Light Infantry20/07/1918 Age: 25 I. D. 8. United Kingdom Private 11478King's Own Scottish Borderers14/09/1914 Age: 20 I. C. 6. United Kingdom Private 24476York and Lancaster Regiment21/07/1918 Age: 24 I. A. 27. United Kingdom Private 39195South Staffordshire Regiment12/06/1918 Age: 28 I. F. 15. United Kingdom Private S/25887Cameron Highlanders23/07/1918 Age: 20 I. C. 13. United Kingdom Private 10944Grenadier Guards24/09/1914 Age: 28 Sp. Mem. United Kingdom Private 39408King's Own Yorkshire Light Infantry20/07/1918 I. B. 8. United Kingdom Lance Serjeant 200957York and Lancaster Regiment20/07/1918 I. D. 3. United Kingdom Private S/23715Black Watch (Royal Highlanders)24/07/1918 Coll. grave. I. H. 1-6. United Kingdom Private 24628King's Own Yorkshire Light Infantry20/07/1918 Age: 28 I. E. 14. United Kingdom Lance Corporal 39368King's Own Yorkshire Light Infantry20/07/1918 Age: 41 I. D. 33. United Kingdom Private 58116King's Own Yorkshire Light Infantry20/07/1918 Age: 19 I. D. 29. United Kingdom Lance Corporal 201912King's Own Yorkshire Light Infantry20/07/1918 Age: 23 I. B. 15. United Kingdom Private 242150King's Own Yorkshire Light Infantry20/07/1918 Age: 28 I. A. 15. United Kingdom Private 202409York and Lancaster Regiment20/07/1918 Age: 20 I. B. 12. United Kingdom Private 116399Machine Gun Corps (Infantry)31/05/1918 I. E. 7. United Kingdom Private 5163Machine Gun Corps (Infantry)06/06/1918 I. C. 2. United Kingdom Private 202511York and Lancaster Regiment20/07/1918 Age: 25 I. D. 2. United Kingdom Private 202540York and Lancaster Regiment20/07/1918 Age: 22 I. B. 6. United Kingdom Private 43883York and Lancaster Regiment20/07/1918 I. B. 3. United Kingdom Private 241616York and Lancaster Regiment21/07/1918 I. A. 10.